You can always write down your lines or questions. And if you get frustrated not being able to solve the problems I post, don't hesitate to ask! To be honest, I also got a headache with this one:) Difficult times while training, easy life in tournaments! Very complicated study. Afek's chessvibe study this week is a lot easier though very nice. This week's chesscafe study is really neat in my opinion and you might like to have a look. In the study position from Afek presented here, my plan is to promote the b6 pawn into a queen which should mate. I am not sure I have got all the details straight. I won't signal all the checks with a + sign. There are too many. 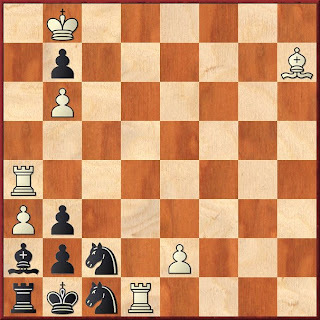 Of course it is a long line, but the position of the pawns b7 and b6 calls for a rook sac on c6 which is unavoidable for black, gives black tempi with his (now) c-pawn. Meanwhile white can promote his b pawn and mate with his queen(I think). I also like the idea of the rook going up the ladder (in one totally bogus line, I even imagined the other rook doing it too) to be sacked on c6. A very unusual position and after passing through e4, how come the white rooks can't seem to do more? Also, the black c2 knight's escape square doesn't seem to matter in my lines, which is a bit unusual. It's a challenging solving exercise but the position seems a bit messy to me. Their line was: 1.e4 N somewhere 2.e5+ Nc2 3.Re4 (not 3.Ra6? bxa6 4.e6 a5 5.e7 a4) 3...Nxa3 4.Ra4+ Nc2 5.Ra6 bxa6 6.e6 a5 7.e7 a4 8.e8R a3 9.Re4 N somewhere 10.RxN#. But your lines are also very good! That means, you should let the world know that you just cracked a study which took the first prize in the Mat-Pat tournament 1987! The study was composed by Van O.Yefrosinian and A.P.Grin. The engine doesn't see at the beginning 1.Re4, only 1.e4 winning. But after a while it gives 1.Re4 as the best move! Thanks for the new studies. Any idea about how to tell the world about the cook? I had found a cook (a better solution) in a study by Nimzo (1917) published a few ago by chesscafe. I gave them feedback but didn't here anything back (I even found a fix, but it has a significant aesthetic flaw - a capture on the first move). I was interested in spreading the word there too as I thought an experienced composer might find a perfect fix.